Don't forget to reserve your parking space in advance when you prepare your visit to the Stadium. In most cases you will benefit from preferential prices (depending on the event) in doing so. The corresponding information sheet for the event will help you to find your parking spot. In Zone A of the Pierre-Mauroy Stadium there are parking spaces for more than 3,500 vehicles (A1, A2, A3 car-parks). These car-parks all have exits leading directly on to the Stadium's parvis for quick and easy access to the entrances. The A1 MOTORCYCLE-park has room for around 500 motorcycles and is free of charge for motorcyclists on event-days, subject to availability. The A2 car-park has around 3,000 parking spaces. This car-park has an exit leading directly on to the Stadium's parvis for quick and easy access to the Stadium entrances. The A3 car-park is an underground car-park for the "Stadium Terraces". This car-park has around 350 spaces and provides privileged parking facilities for the site's hotels and restaurants. You can use this car-park on event days for a fee, subject to availability. 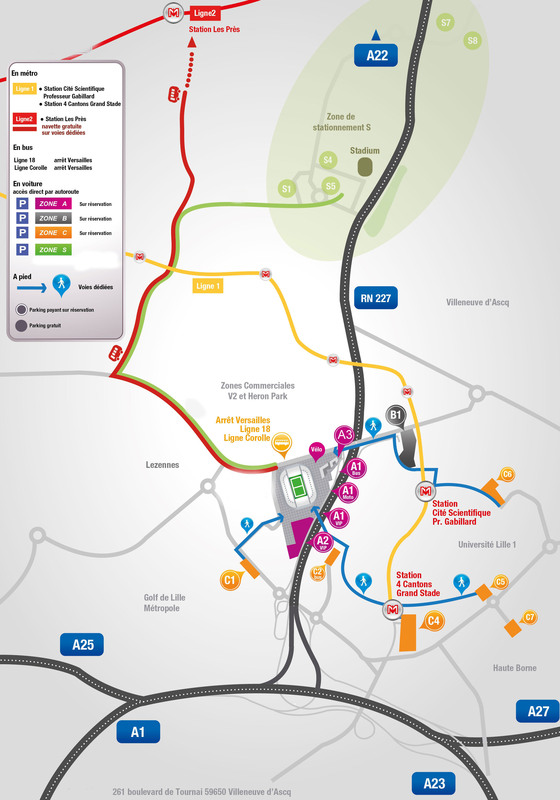 The zone B and C car-parks are located less than 5 minutes walk from the stadium, providing easy nearby parking facilities. The B1 car-park has 1,400 places and is 6 minutes walk from the Stadium on the Boulevard de Tournai. The C1 car-park has 700 places and is 5 minutes walk from the Stadium's South entrances on the Rue du Virage. The C4 car-park has a capacity of 1,500 spaces and a "P+R" space (accessible 7 days/week on presentation of a TRANSPOLE ticket) and/or may be available for a fee for certain events. This car-park is located next to the "Quatre Quantons" metro station, 10 minutes walk from the stadium on a special footpath. The C2 BUS-park provides free parking during Stadium events for coaches, subject to availability. It has spaces for 40 buses and is located near to the Stadium, access via a footbridge over the N227 main road. Don't forget to reserve your parking space for an event in advance, and benefit from preferential rates and a location near to the Stadium. These spaces are on sale through the usual outlets and the Stadium's website. It is also possible to access the car-parks on event days via the special Card Payment entrances, subject to availability. Car-parks are usually open 1h30 before the Stadium opens to the public and are closed one hour after the end of the event. We strongly recommend that you check the precise times in the event descriptions provided with ticket sales or on the Stadium website. There are no special prices for disabled drivers. Special disabled parking spaces are available in each car-park (on purchase of a normal parking space). Maximum height is 1.9m, if your vehicle will not fit we recommend that you use the C1 car-park which has an uncovered area (normal parking space ticket).